Public Mobile, Canada's prepaid wireless brand, is launching its first ever brand campaign, ‘Less for Less’. The campaign promotes the cooperative wireless company backed by TELUS’ mission to trim the excess frills other networks offer and provide Canada’s largest mobile network at the lowest rates possible. Developed by creative agency Cossette, the tongue-in-cheek campaign shines a spotlight on the unnecessary extras Public Mobile doesn’t offer to show how they keep their rates so low. Instead of providing stores, kiosks, call centres and big budget advertising campaigns, Public Mobile would rather operate with fewer frills and keep costs low for their customers. Since Public Mobile has trimmed its advertising budget, shooting a commercial would have been too expensive. Instead, four online videos were created using only the audition tapes of actors hilariously acting out scenes – from paragliding to rock climbing – in an empty casting room. 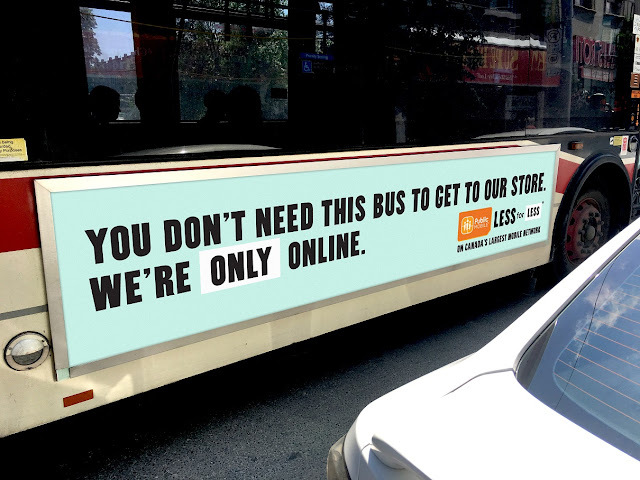 Additionally, a single billboard is setup in downtown Toronto with “This is our only billboard. We need it to say a lot.” as the headline. Long and condensed copy follows to squeeze in descriptions of all the benefits Public Mobile offers. “We do wireless differently – no stores, no call centres, no overages, simple and straightforward plans, and loyalty rewards to earn even more savings. Consumers are looking for the best phone plans on the market without having to compromise on network quality. With less frills, they can have their cake and eat it too,” says David MacLean, Head of Public Mobile. “Public Mobile champions the wireless consumer and Cossette wanted to showcase its values in a thoughtful manner. 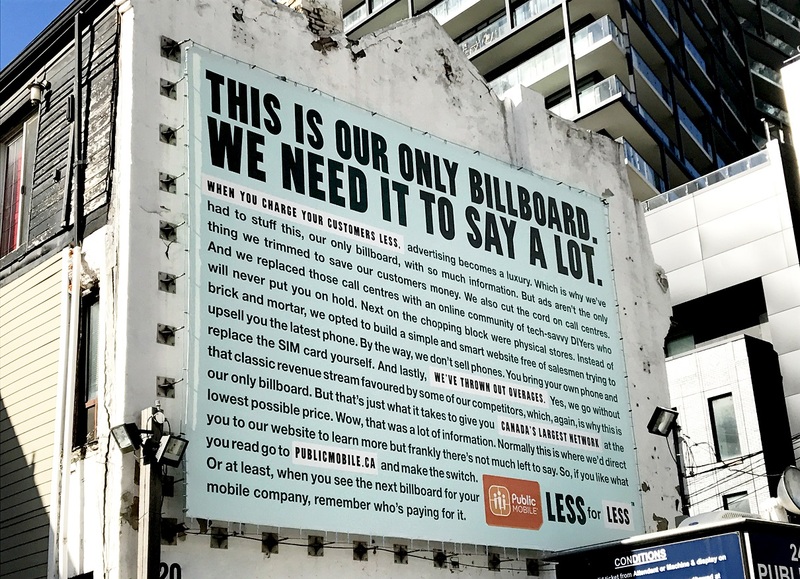 ‘Less for Less’ demonstrates how the brand truly challenges the norm to keep rates so low,” says Carlos Moreno, Chief Creative Officer at Cossette. The out-of-home campaign will run for nine weeks, with online videos running until the end of August.